The fragrance of our silver needle is light, akin to freshly bloomed flowers. The flavor is juicy, filling the mouth with a smooth and lingering sweetness. The sweetest of the white teas, Silver Needle is made up of only buds from the tea bush. Meticulously separated from the stem, the buds are fanned on to a single layer and dried naturally until 90% of their moisture is removed. The drying process is then completed indoors when the tea is roasted over charcoal. During the roast, the tea is separated from the charcoal by bamboo trays lined with paper. 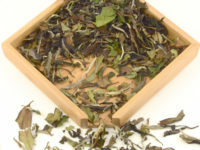 The very low temperature drying of this tea is designed to preserve the white color of its buds. Too high of a temperature will make the buds yellow. High quality Silver Needle should be made up of large, healthy tea buds with most of their white fuzz intact. When infused, the buds will turn to a light green color right away. The color of the infusion is like a light honey. When compared to infused green tea, it will appear slightly yellow. For first time tea drinkers and seasoned aficionados alike, Silver Needle is a very approachable tea. It is easier on the stomach than a green tea and even a long infusion in high temperature water will not bitter the flavor. You will find it very easy to drink and very easy to brew. High altitude silver needle tea garden in north Fujian Province. Temple in Tai Mu Mountain, where the oldest white tea bush lives. Monks are always growing and watching famous teas in history. Da Bai Hao bush over 60 years old and 2m high. One of the oldest white tea bushes. It is more than 100 years old . On Tia Mu Mountain in Fuding City, Fujian Province. Silver Needle drying naturally in the sun. Silver Needle is placed on bamboo trays to naturally dry by the sun. Infusion: First infusion at least 3 minutes. The leaves are good for 5 infusions. Add a little more time for each subsequent infusion.